Metro Phoenix apartment demand is high—so high, one developer is tearing down a full block of 20 homes in Central Phoenix to accommodate a 329-unit apartment complex. 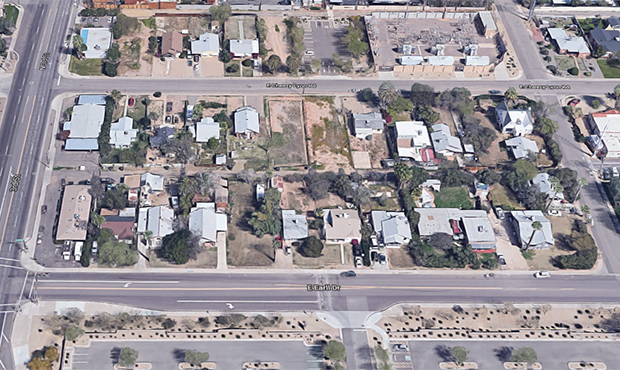 The 20 homes, built between 1915 and 1950, met the wrecking ball this month as crews began razing the aging and, in some cases, rundown structures and clearing the 3.6-acre site, located on the block between Third and Fifth Streets, Early Drive, and Cheery Lynn Road in Central Phoenix. Third Street and Earll Drive site ready for the demolition of 20 houses to make way for the new Crescent Midtown apartment complex. (Photo: Google Maps). In approximately 18 months, the site of the former single-family home community will be home to the gleaming new Midtown apartment complex according to its developer, North Carolina-based Crescent Communities. Crescent purchased the homes and a few vacant lots in the community for nearly $7 million, buying each property individually from the owners back in March. None of the homes being demolished are designated historic. Before demolition, the homes were made available to Phoenix police and fire departments to use for training. While the project is seen as a welcome addition to the city’s forward-looking apartment development initiative, including two additional large apartment complexes currently under construction, preserving Phoenix’s historic houses and structures is a priority among historic building advocates as demand for apartment rentals rises steadily. The escalating rental housing demand stems from rapidly-growing growing numbers of workers relocating to the Valley for job opportunities among the region’s exploding tech, manufacturing, services, and startup business industries, as well as a steady stream of retirees moving from the north to spend their golden years in the warm desert environment. Currently, nearly 18,000 apartments are under construction in the Valley area, and more than one-third of them are going up in Phoenix. Developers are focused on meeting the city’s need for architecturally appealing high-density housing as the region’s economic development is expected to continue expanding exponentially through 2030 and beyond. For large- and small-scale rental property investors, Phoenix is a land of long-term income opportunity that forecasters predict will be in demand for years—and even decades—to come.